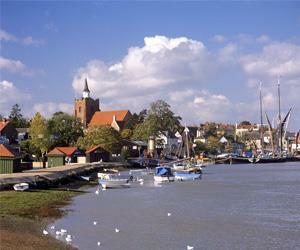 Maldon TownVisitors have been coming to Maldon district for a day out or holiday for many a long year. During the 18th century the growth in interest in saltwater bathing began to bring leisure visitors to Maldon. The extension of the railway to Burnham-on-Crouch in the 19th century meant that the town was more accessible; two London based sailing clubs moved to the town, and its popularity as a yachting venue grew. Most people are surprised at the way the villages and towns of the district have retained their original character and individuality although so close to major centres of population. There is a growing interest in walking, cycling, fishing, the study and observation of the natural world and other activities in the countryside. All around the district are nature reserves and footpaths, which allow unrivalled access to wildlife habitats, which are important, even on a global scale. The old railway line from Witham to Maldon is again bringing visitors to the area; it is a waymarked route for use by cyclists and walkers. The Chelmer and Blackwater Navigation offers further possibilities in the relative calm of non-tidal waters. Visitors have been coming to Maldon district for a day out or holiday for many a long year. During the 18th century the growth in interest in saltwater bathing began to bring leisure visitors to Maldon. The extension of the railway to Burnham-on-Crouch in the 19th century meant that the town was more accessible; two London based sailing clubs moved to the town, and its popularity as a yachting venue grew. Reasons for visiting Maldon district are as varied as the attractions, amenities and leisure possibilities the area has to offer. The recently re-designed Promenade Park with free a water Splash Park, galleon play ship, ornamental lake, model boating lake and amphitheatre is a must for everybody and will make your visit complete.